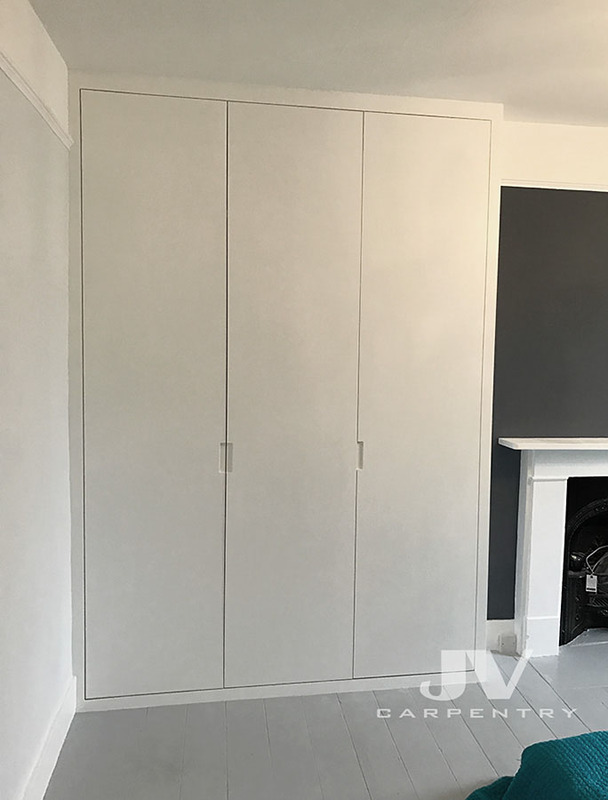 This fitted wardrobe is 2.4 meter wide and 2.3m tall and was installed for a client living in a 3 bedroom house in Hanwell West London area. It was hand-painted on site to grey eggshell finish. Interior of this wardrobe made with shoe racks and some shelving and hanging space. 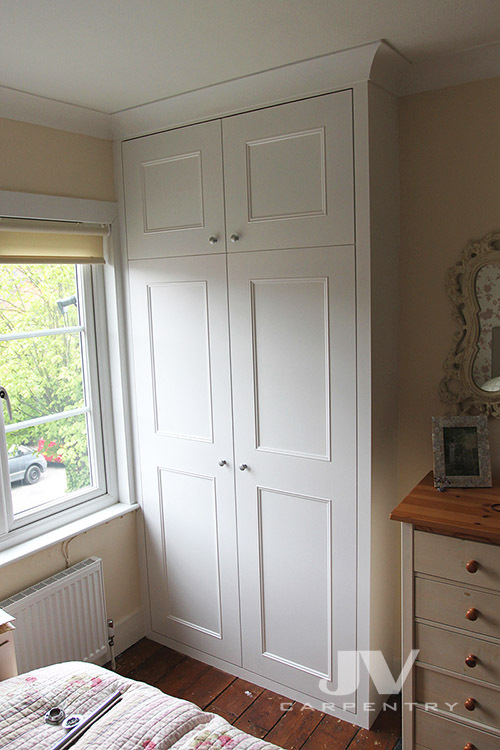 Fitted wardrobe with shaker panelled doors and plain trim around. It was built for a client living in a flat located in North West London. 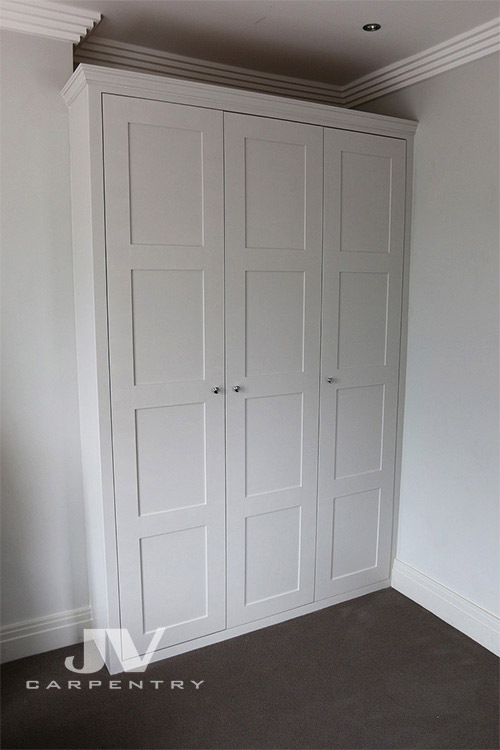 This wardrobe fitted into the alcove space. It feature a simple modern finish and made with cut-out handles. Interior made with some shelving and hanging space. the unit is around 1.5 meter wide and 2.9 meters tall. Made of MDF and hand-painted in situ to white eggshell finish. Kilburn, north west London. This clean-line contemporary wardrobe is 1.5 meters wide and 3 meters tall and contain eight drawers and mix of shelves and hanging rails behind doors and nicely fitting all of his and hers clothes. It was built for a client in small property in Battersea where space was limited and every inch mattered. 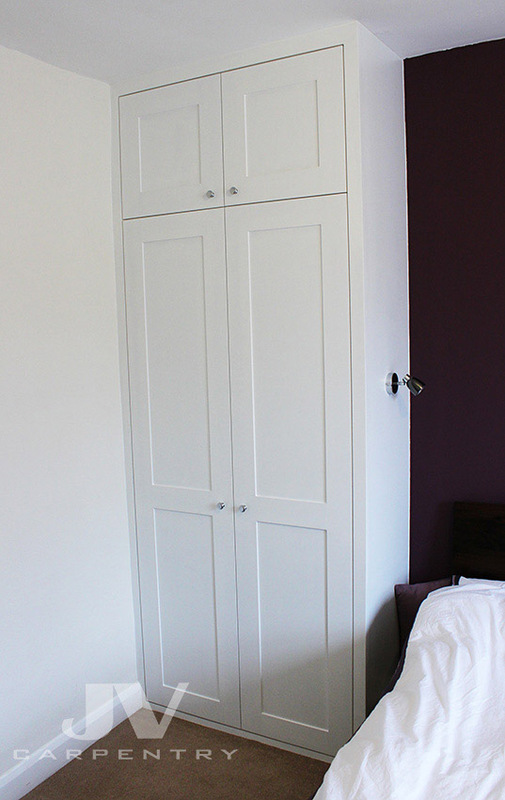 The wardrobe is made of quality MDF hand painted in the property after been installed. The project took 3 days. 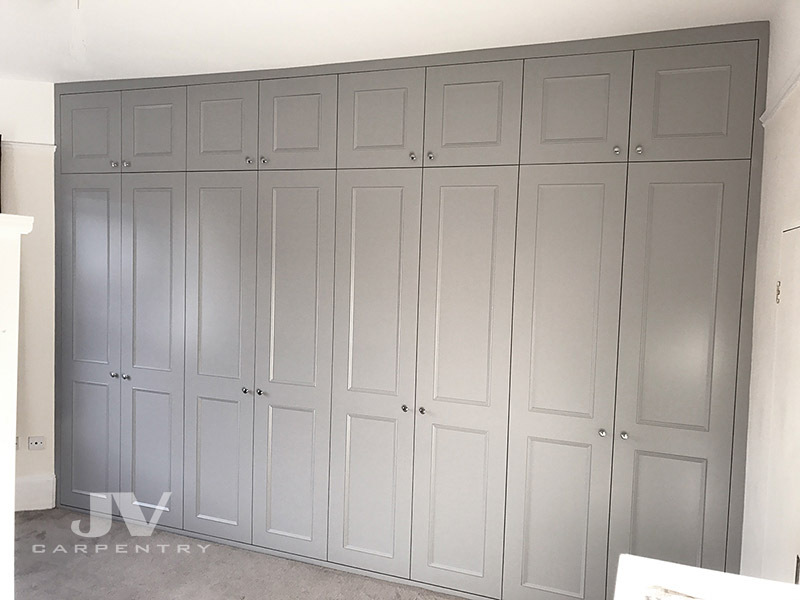 This classic wall-to-wall wardrobe is 4.1 meters wide and 2.8 meters tall and was made for a client living in a two bedroom house in Putney West London area. 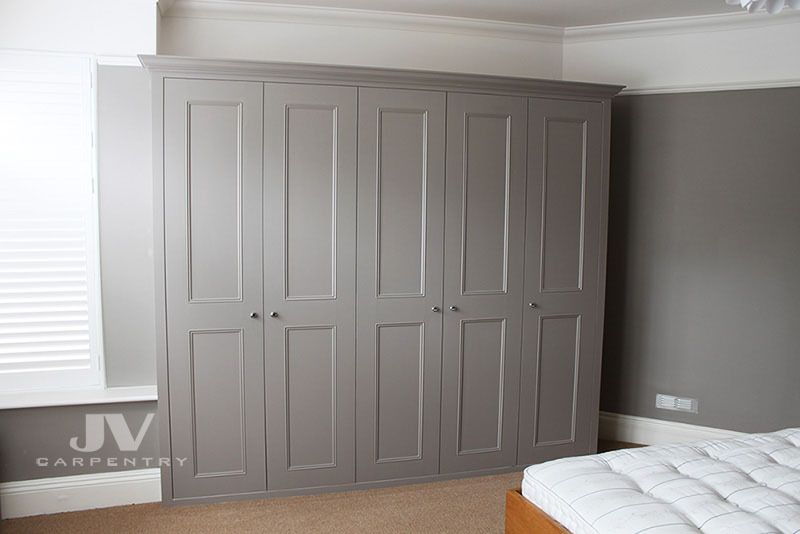 The wardrobe is made of MDF and hand-painted on site to a grey eggshell finish. The structure houses six large drawers, shelves, three pull-out shoe racks and hanging rails. The project took 6 days from start to finish. 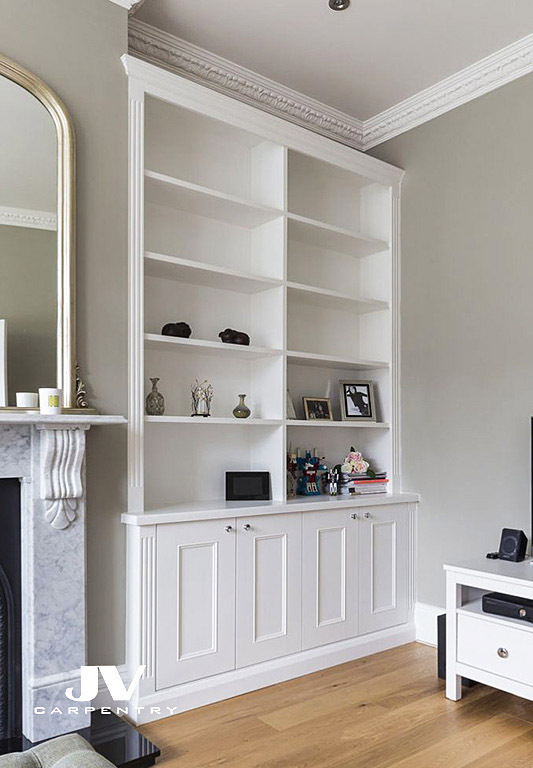 These traditional alcove wardrobes fitted either side of the chimney breast were designed and built for a client living in Victorian property in East London. The details on the wardrobes perfectly matching original style of the house. 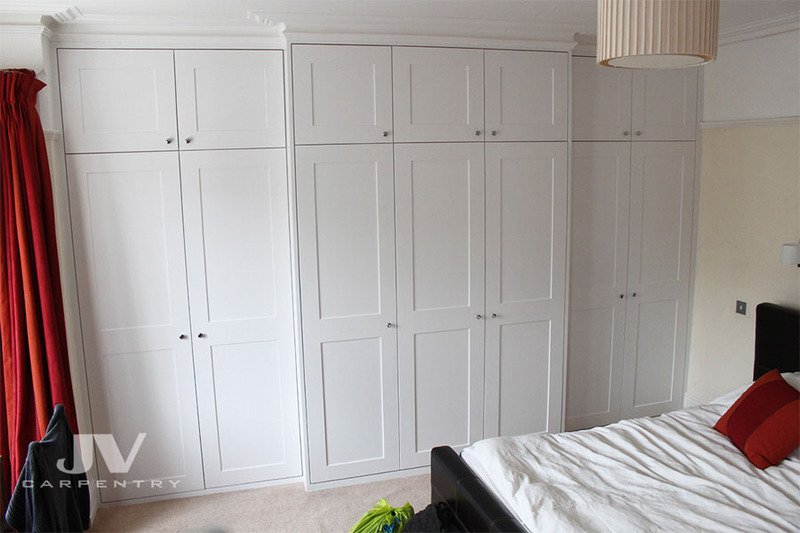 These fitted wardrobes made out of MDF and hand painted in situ by JV carpentry in Ilford. 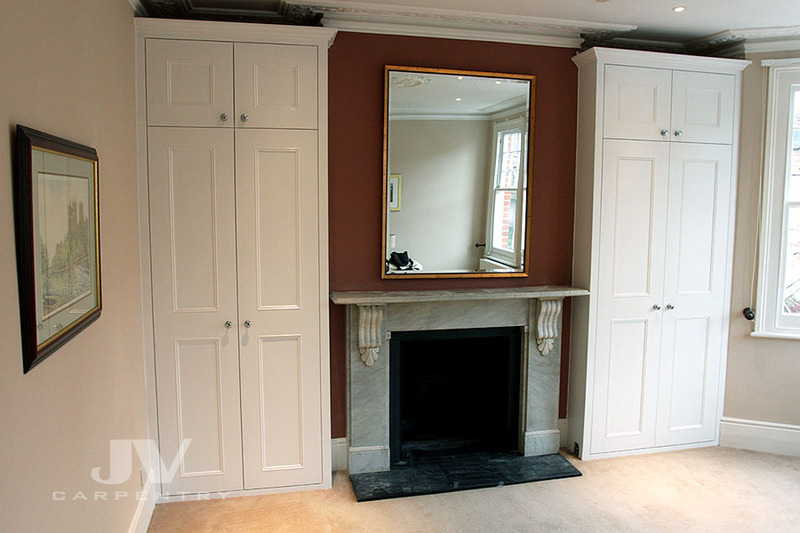 This shaker wardrobe made around chimney breast with that middle sections coming out in front of the chimney and sections on either side fitted into the alcoves. Traditional coving fitted along the top to create feeling that this wardrobe was built with the house at the same time. 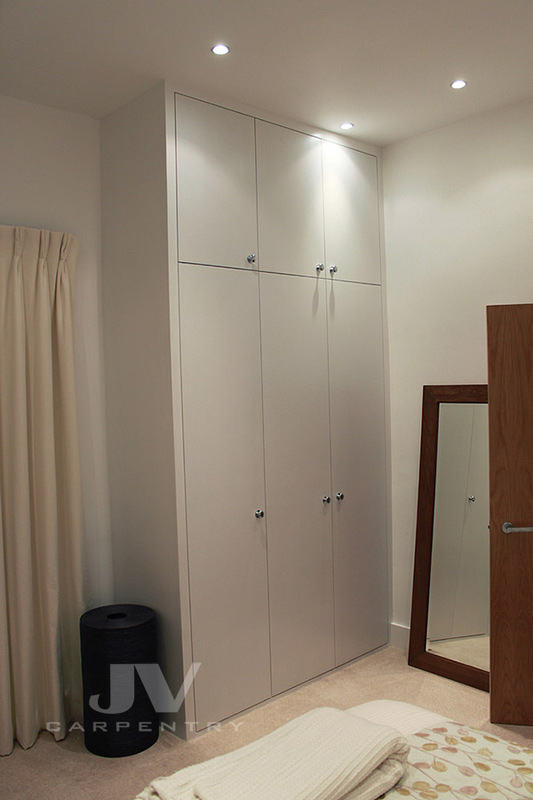 Interior of this wardrobe made with some drawers and shoe racks to maximise the storage space. 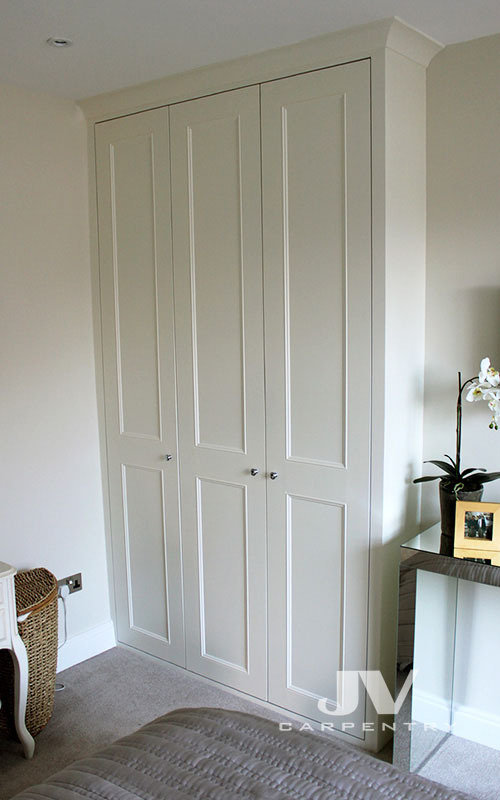 This wardrobe was made for the client in Fulham, South West London. 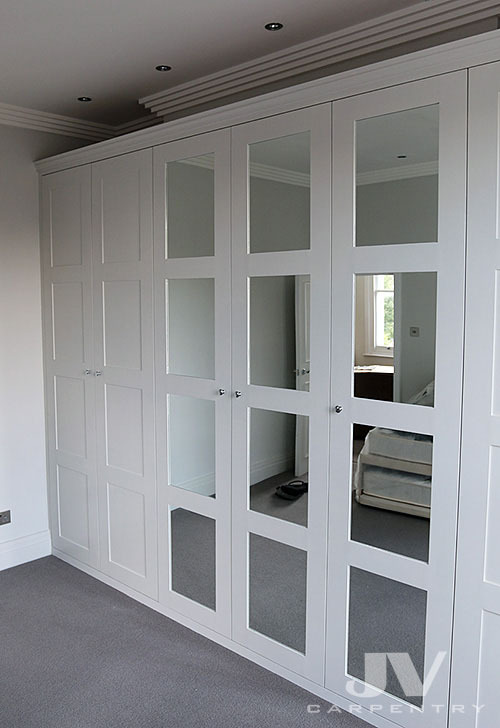 Traditional alcove wardrobe made with panelled mirrored doors in the middle was built for a client living in Hammersmith, West London. The wardrobe is 3.6 meters wide and 2.5 meters tall. 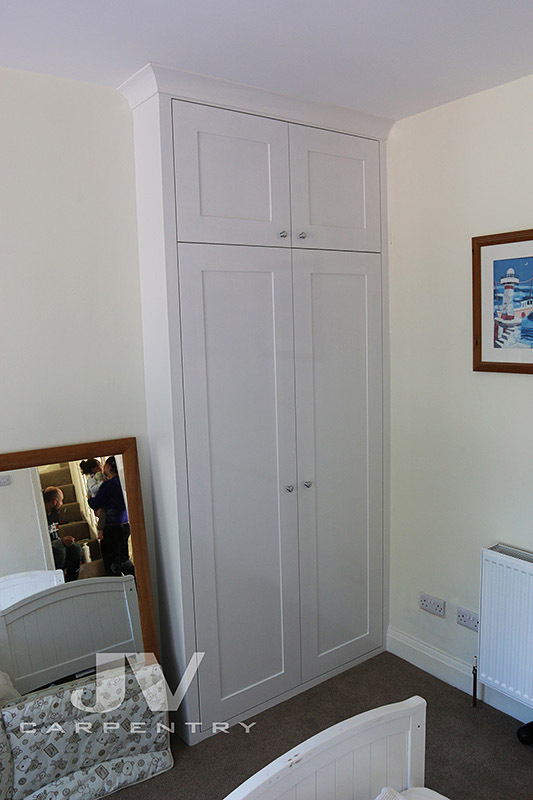 To keep originals details of the room this wardrobe was built with the gap between the ceiling. Made of MDF hand-painted to an off-white eggshell finish. Three middle panelled doors are faced with mirrors to maximise the light in the room. Installation and painting took no more than 5 days. 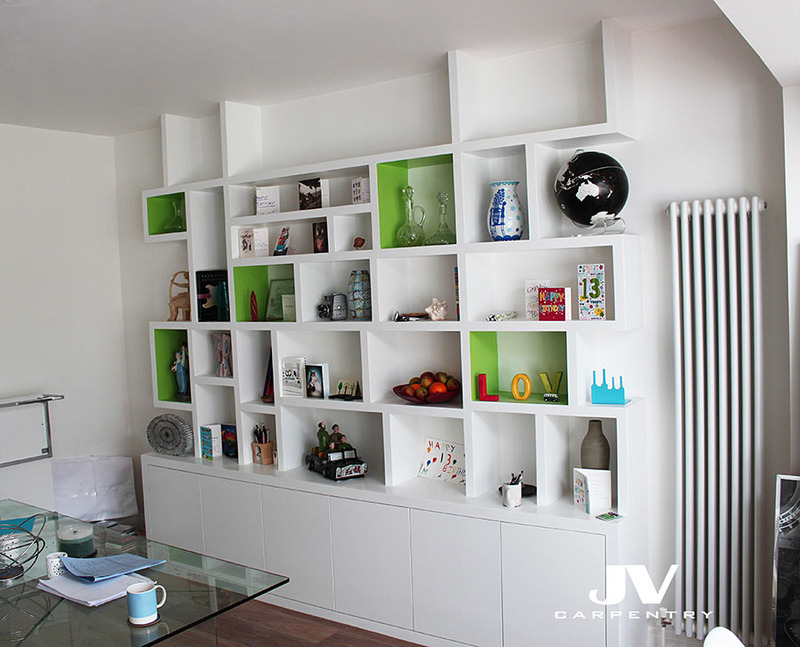 This large contemporary clean-line row of cabinets and chunky shelves was installed in modern property in Shepherds Bush area. The client who gave us this idea and helped us to design this unit named it a 'crazy paving like' shelving unit. This configuration of the shelves make this unit unique piece of furniture with plenty of space to display your items and store your books. The doors equipped with push catches and cupboards nicely fitting all things you wish to hide from view. 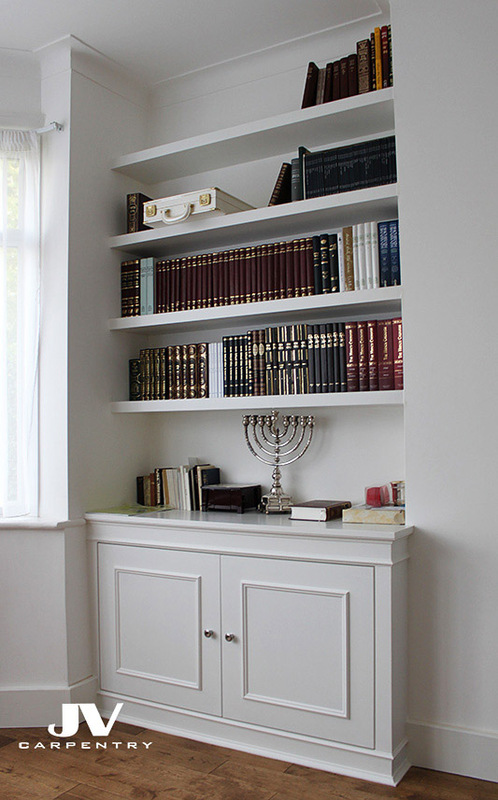 Classic alcove cupboard with bookcase above. 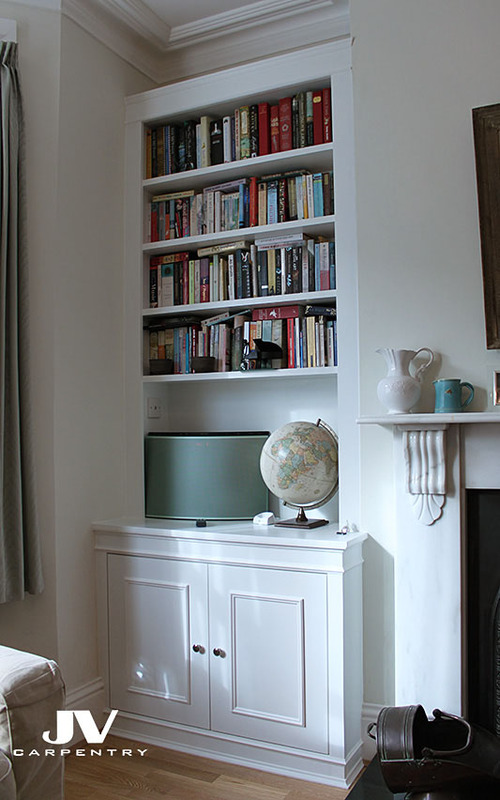 Similar to the example on the left but instead of floating shelves made traditional way with framed shelves. These classic alcove units were designed and made for a property in Lee, East London that kept all of its original features from the past. The units feature bottom cupboards for storage with moulded panelled doors and three grooves on the frame and open shelves above. The units are around 1.5 meter wide and 2.8 meters tall. Made of quality MDF these pieces of furniture were installed and hand-painted in around four days. 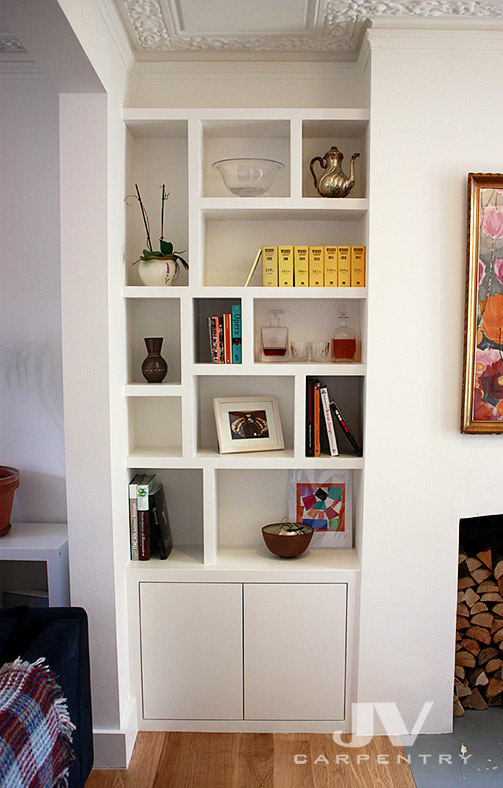 These contemporary alcove units were made for modern property in Wandsworth , South West London They are around 1m wide and made with plain, push to open cupboard doors and chunky shelves with different size cubby holes.